In The Old Ways, Robert Macfarlane speaks to us as he walks countryside in a dozen British and international locales. That is simply said, but the depth and richness of this literary journey easily fills 360 pages. This is not a guidebook, although we get a close look at a variety of places. In parts, it is an adventure in words, history, literature, nature, personal inquiry, human behavior, and sense of place. 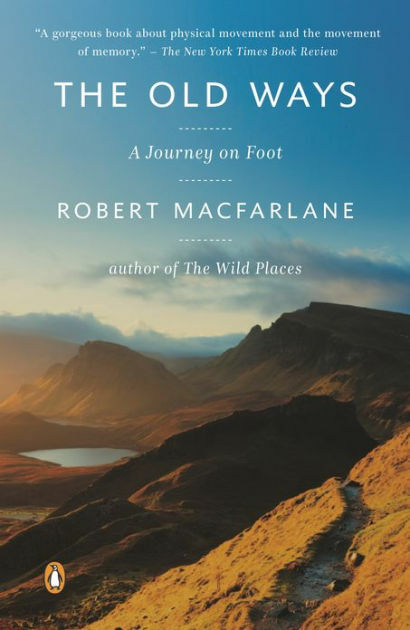 Macfarlane describes his thoughts and observations as he walks, and that is a treasure. Also in parts: this is a collection of chapters, which could also each stand alone as an essay; even so, chapters proceed in a rough chronology over an indeterminate time period; more broadly, he shares segments of his life’s journey of the mind, enriching literary impressions as he wanders. Macfarlane’s book shares its title with a Gary Snyder essay collection of the 1970s published by Ferlinghetti’s historic bookstore, City Lights; but the title senses are different, while still related. Snyder’s book could as easily been titled Staying Put (more recently adopted by Scott Russell Sanders) as his “Old Ways” took the typical American word-sense and put deeper meaning to it, as in: “the good old days”; a way of life, which encompasses cultural thoughts & values closely embedded in a place, spiritually and organically vital to the people living there. Above all else, the magic in these pages is Macfarlane’s way with words; I can hardly explain the eloquence. Description flows beautifully and wraps the reader in feeling, in myriad ways, a place described. His British English – and a commitment to precision, lost words, etymology and meaning – can mystify and charm. At one point he explores the word saunter in four languages, arriving at its best precise use. He refrains from analysis or proclaiming held-values or tragic history; his words translate observations so subtly and powerfully, we feel the implications ourselves. Humility permeates his writing voice, and the characters he admires. He rarely includes himself in observation; as he is often walking and sleeping in harsh conditions, we do not learn how he does it, how he is equipped or how he feels about it. Rather he is ever looking outward to the pathway’s course, or to inward thoughts; his own circumstances are mere distraction. All of these people had been animated at first by the delusion of a comprehensive totality, the belief that they might come to know their chosen place utterly because of its boundedness. And all had, after long acquaintance, at last understood that familiarity with a place will lead not to absolute knowledge but only ever to further enquiry. One of his favorite writers is Edward Thomas; though he died in 1917, Thomas’ physical & life’s journey is Macfarlane’s personal obsession, and a common thread throughout the book. Yet there are many others, and Macfarlane is widely read while not effete; variously, he also invokes Hansel & Gretel, Tolkien, Hiawatha and the Iliad. For this reader, for all that Macfarlane appreciates others, his own prose is unsurpassed and suffers companions only for amusement. Macfarlane’s observations do not comprise a purist homage to nature or wilderness; these are walks through long-inhabited places, featured with relics and scars left by ancient ancestors of those who still walk today. Quoting the walking Thomas, while again seeming to reflect on himself: “He liked the evidence of human mark-making and tampering over the millennia… testifying to a landscape that was commemorative, tending to the consecrated.” Macfarlane places importance on staying connected to that past, with clear observation, nuance and consideration. One is drawn to the impression, lulled by our guide’s example, that seeking too much grand meaning can obscure rather than reveal what these already faint tracks offer inquiring minds. Nonetheless, we may seek: for example, how different would perception of our past ways be, if the ancient marks and messages on American landscapes belonged to our own ancestors, rather than to native voices prematurely silenced? This, I thought, had been the real discovery: not a ghostly retrieval of Thomas, but an understanding of how for him, as for so many other people, the mind was a landscape of a kind and walking a means of crossing it.